Living Indie Contest for UK Indietronica Bands! Living Indie has launched a contest for unsigned and up-and-coming indie and electronica music acts from across the UK. The contest will invite bands and singers to generate support for their entries on social media, with the six finalists playing a live-streamed show on 7 September at London’s world-famous 100 Club. The winners will then get to play two sets at Monkey Week, Spain’s No 1 music industry festival, held in October in the beautiful coastal town of Puerto de Santa Maria. From today, UK-based singers or bands can submit their entries of original material via Living Indie’s portal here. The artists will then have two weeks to build up the most votes using the hashtags #Living[plus band name] and #LivingIndie. 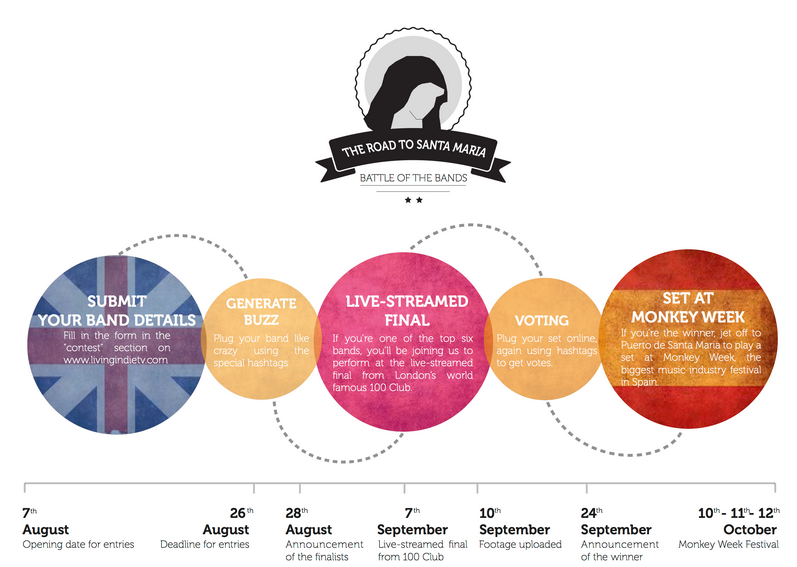 The voting for the ultimate winner will take place entirely online, using footage from the final. The final will be streamed live on Indietronica.org from one of London’s most iconic live music venues, the finalists will gain invaluable exposure along with a free, high-definition recording of them playing live. The winners will be playing in front of music-industry figures from across Europe, amid some of Spain’s most picturesque coastal surroundings.